My first collection of patterns are mostly based on animals that I think are super cute. 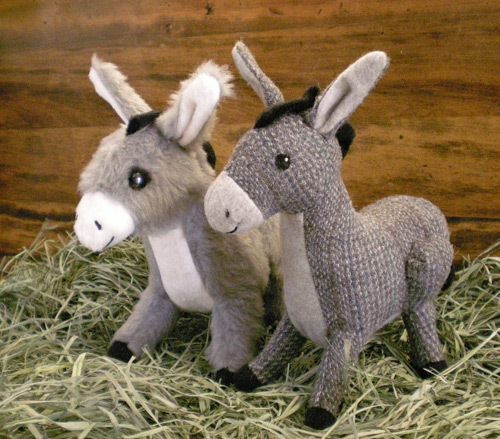 I love donkeys, so it seemed natural to make a plush version. All the real donkeys that I've been around have been really sweet and goofy, I haven't had to deal with their ornery side. I start out the design process by sketching lots of characters from realistic to simplified cartoon. I choose the look that I'm going for, then I proceed to break it down to simple shapes. Specifically for this project I wanted to make all the patterns fairly easy to use, so that was at the forefront while I was designing. After some sketches I make the scale drawing that I will use for reference in the pattern. This is the drawing that I will place the roughs up to as I am working out the pattern pieces. The fabric makes a huge difference in the outcome and does change the shape of the pattern as I create. Even though the finished product will most likely made out of knit fabric (as most faux fur is) I make my rough drafts out of woven. I don't want any extra stretch while I'm making sure all the pieces fit together. You can see in the top photo how different fabrics can change the look and feel of a character. 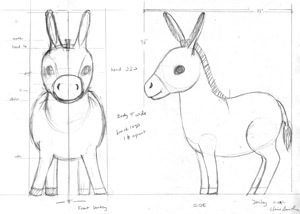 If you want to make a donkey of your very own, check out the pattern in the store.